PREMIUM QUALITY low modulus hybrid polymer sealant. Odourless. Extended open time versus silicones to allow longer tooling of product. 100% Hybrid Polymer sealant, no shrinkage. Primerless adhesion on nearly all common construction materials such as plastics, masonry, metals and.wood - even when surfaces are damp. Can be used on sensitive metals such as copper and lead, Non-staining when applied on natural stone substrates, with no hydrophobic effect. No bubble formation within the sealant when applied on damp surfaces. High performance mechanical properties. Colour stable and UV resistant. Free of harmful chemicals - isocyanates, solvents, halogens and acids. Paintable with all water-based paints. Excellent weathering resistance in all climates. Easy to apply, even at low temperatures. 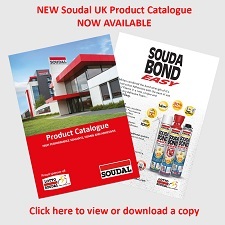 Airtight when used as part of Soudal Window System - SWS®. Construction and industrial sealing applications. Perimeter sealing of all window and door frame substrates – PVCu, aluminium and wood. Sealing of roofline and drainage systems. Sealing of expansion and connection joints in the building industry, including natural stone. Roofing seals including lead, copper, roofing slates and fibre-cement. Industrial applications; coated metals, anodized aluminium, stainless steel. HVAC ducting, pipework and drainage joints. General maintenance and sealing.